Mobile platforms are taking the lead in the digital world! Use mobile-based marketing to reach even more consumers. The number of users with smartphones has exploded in recent years, and far outnumbers conventional PC users. The potential reach of this avenue of marketing can not be ignored. Typical banner ads can be easily passed-on by the eye while looking on a mobile screen. Mobile marketing forms stronger bonds with their users, and is a way to reach them anywhere, anytime. Mobile marketing gives your brand many opportunities to interact with its users on a more personal level. In this day and age, we no longer are limited to targeting our audience by using specific data like gender, age, and location. 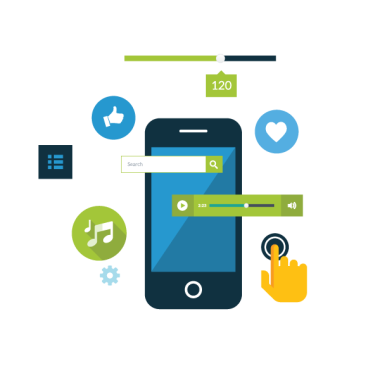 We now analyze user's interests, based on mobile browsing data, as well as other factors to reach a more specific target audience. With our experience in website development we can tailor your project to your specific and individual needs. As a team leading the way in professional mobile marketing we can manage your complete mobile campaign from profiling your target audience, to the entire design and development, right to the progress reports and follow-up on your campaign. Our team provides you with a complete analysis of strategy for mobile marketing, perfectly tailored for your business needs. This is a huge opportunity for your business - go mobile! By focusing our efforts on beautiful mobile and desktop design we provide an amazing browsing experience for each of your users. All our campaigns are based on accurate consumer targeting. This is essential to successful mobile marketing. We utilize a multi-channel approach to all of our mobile marketing, including the use of very effective SMS mobile campaigns.